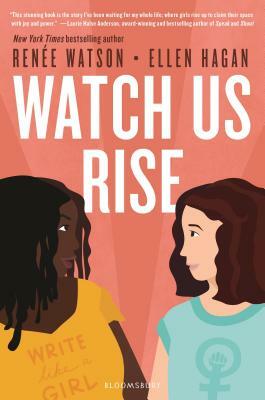 Newbery Honor and Coretta Scott King Award-winning author Renée Watson teams up with poet Ellen Hagan in this YA feminist anthem about raising your voice. Jasmine and Chelsea are best friends on a mission--they're sick of the way women are treated even at their progressive NYC high school, so they decide to start a Women's Rights Club. They post their work online--poems, essays, videos of Chelsea performing her poetry, and Jasmine's response to the racial microaggressions she experiences--and soon they go viral. But with such positive support, the club is also targeted by trolls. When things escalate in real life, the principal shuts the club down. Not willing to be silenced, Jasmine and Chelsea will risk everything for their voices--and those of other young women--to be heard. These two dynamic, creative young women stand up and speak out in a novel that features their compelling art and poetry along with powerful personal journeys that will inspire readers and budding poets, feminists, and activists. Renée Watson grew up in Portland Oregon, came to New York for her degree in writing, and now teaches poetry in the New York City Schools. Her books include Betty Before X, Harlem's Little Blackbird: The Story of Florence Mills, A Place Where Hurricanes Happen, and What Momma Left Me which debuted as the New Voice for 2010 in middle grade fiction by The Independent Children's Booksellers Association. NIA: Women of Color SB - Why are all the Black kids sitting together in the cafeteria?